This is another post in the Philadelphia2050 series. The Market-Frankford Line (locally called the "el") is the busiest heavy-rail route in Philadelphia, with some 180,000 daily riders, a number that compares favorably with anything the CTA, MTA, WMATA, or MBTA could put forward. It is a broad-gauge line using under-rail contact third-rail electrification, a setup totally unique in the United States, and its dynamic envelope is somewhat narrower than the Broad Street Line's. The line doesn't have any express tracks, and in fact, its daily operation pattern is near-optimized given its constraints. Its current trains are 8 cars, the same length as the line's shortest station, 5th Street; lengthening this station might allow longer trains, certainly necessary given the line's frequent crush loads. 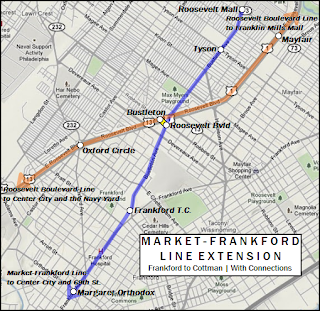 The line currently terminates at Frankford Transportation Center in the near Northeast; while the capacity constraints laid out above prevent it from being used as a Northeast subway, a relatively short extension may be used to help the capacity problem. 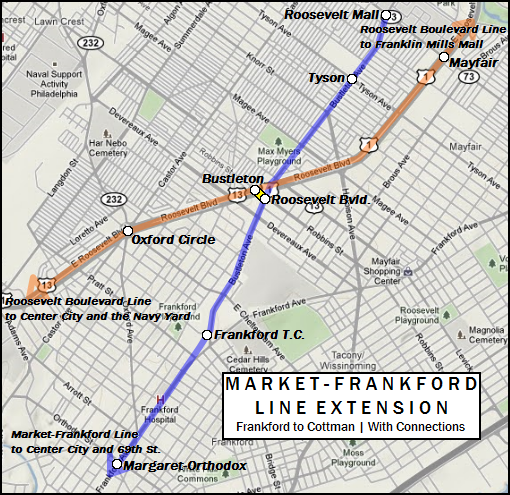 This extension would involve a connection with the proposed Roosevelt Boulevard subway at Bustleton Avenue. Since the Boulevard subway would connect into the Broad Street tunnel, which does have express tracks, and a surprisingly high proportion of el riders go from Center City to the Northeast, with a transfer at Frankford, this expansion would be integrated into the Phase I construction of the Boulevard line in order to hopefully cut the el's ridership some--as I mentioned, congestion is an issue at peak hours, when train cars are beyond SRO and simply packed to gills. The second part of this extension is an extension to place. The corner of Cottman and Roosevelt is one of the major retail centers of the Northeast, and the el extension there simplifies access to place. With improved access, of course, densification of the heart of the corridor--the stretch of Cottman from the Boulevard through Bustleton to Castor, would be encouraged. Also of interest: the proximity of this stretch of Cottman to Pennypack Park suggests a possible sub-use as a bicycling trailhead. The three new stops (Roosevelt Bvld., Tyson, and Roosevelt Mall) would be expected to generate some new traffic, but this is counteracted by the siphoning effect of the major junction at the Boulevard and Bustleton. A study earlier this decade suggested that a Boulevard subway would have as many as 300,000 daily riders; this extension, being limited in scope, would have far less. Not to nitpick - the line uses six car trains. The rebuilt Market Street elevated stations are only slightly longer than the trains themselves. Are you sure? The last time I checked I was counting the cars when the train stopped at 15th Street and I'm pretty sure I counted 8...although I could be mistaken. In any event, the high ridership the line has should merit, at the very least, longer trains. SEPTA does tend to, however, have a short-train fetish. Quite sure. I've been riding The El almost daily since the age of ten and have only ever seen different train lengths during the Market Street reconstruction and during the delivery period of the M4's. Longer trains would make more sense but I do believe there are equipment limitations - there may not be enough car sets to run eight car consists and maintain current rush hour capacity. I was quite surprised that the new West Philadelphia stations were truncated in length, eliminating the possibility of increasing car lengths without more construction but, again, if there aren't enough car sets to maintain current service and increase train length then it would still be moot. My apologies. I wound up at 15th a couple of days ago and recounted and I was in error the first time. It is substantially easier to extend an elevated platform than a subway platform. Cantilevering some wood struts off of the existing concrete platform is cheap and doable; by contrast, boring out an extension to an underground platform can be, even for relatively short lengths (150 ft. or so) almost prohibitively expensive. the Market Frankford Line never ran trains longer than 6 cars. The previous fleet numbered 270 cars as the line once handled close to 250,000 daily riders but with the population shrinking, 180,000 is still a respectable figure and only 220 cars are needed. As a former transportation engineer for Simpson & Curtin, the ground transportation consulting division of Booz, Allen & Hamilton, the Market-Frankford Line counted about 220,000 boardings in the late 1970's. At that time, peak period headways were about 1.5 to 2 minutes using six-car trains. In fact, it was often stated that the MFSE was the most heavily patronized two-track subway line in America. Tea Party Urban Planning? Bad for America! Where are park-and-rides valuable and useful?